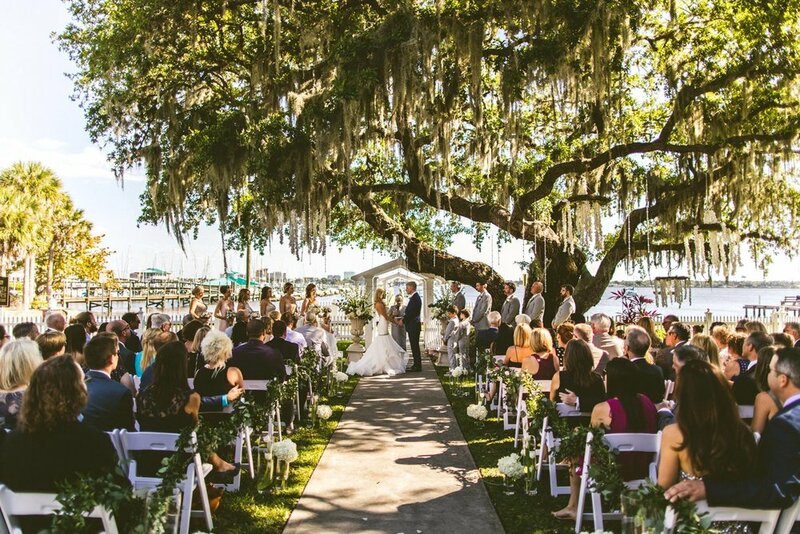 Get help planning your Jacksonville wedding with our detailed guide & downloadable checklists. You just got engaged and you're excited. Now it's time to start planning your big day. Planning a wedding in Jacksonville is stressful, overwhelming, and, often, leads to bridezilla moments. However, you can keep the bridezilla moments to a minimum with the right plan. Our Ultimate Wedding Planning Checklist for Jacksonville Weddings will ensure you're on the right track when it comes to planning your wedding. Jacksonville isn't the same as other locations around the country. You must be ready for hot summers, rainy afternoons, and out-of-control humidity. If you're ready to get started with your Jacksonville wedding planning, our checklist will become your best friend. Item #1 on the list is your budget. Before you do anything else, you want to determine the budget you will be working with. This shouldn't be a rough number, but a very specific number you can use to ensure everything is covered or to make cuts, when necessary. Make sure you set up a detailed spreadsheet to ensure you're ready to track all the expenses you may incur throughout the planning process. It's also important to determine who's paying for what and what they are expecting to spend. Once you've set your budget, the next thing you want to do is figure out what's most important. Is it all about the reception venue? Do you care most about the food? What about the flowers, are they important? List your priorities in order so that you can make sure the most important items are covered within your budget first. This will help to ensure you get the wedding of your dreams without worrying something big was forgotten. Your guest list comes next as it will help to determine the venue and your specific needs for rentals, such as tents, chairs, and tables. Take the time to determine how the guest list will impact the budget, as well. It may be necessary to trim it down if your budget cannot support a large wedding. It's usually safe to assume about 70% of the people you invite will show up, but this may be higher or lower, depending on how close you are to those you invite and how close they live to the venue. Before sending out invitations, make sure to go through the process of cutting and negotiating the guest list to reach a final number. If you plan to have someone help with the planning, you will want to hire your wedding planner next. However, this is another budget item and often the first thing cut when couples don't have a large budget to work with. If you can afford to hire a Jacksonville wedding planner, do so and they will become your right-hand person throughout the planning. Choosing the theme, colors, formality and overall feel for the wedding is important. You want to discuss this with your partner and decide on how you would like the wedding to look and feel. There are several choices and the theme may dictate the venue, to an extent, and will certainly dictate the decor. You may need two venues, actually; one for the wedding and one for the reception. You want to book your venues as soon as possible. Some of the best churches and reception venues book up more than a year in advance. Your venue will also dictate some of the other decisions. Some venues will come complete with tables, chairs, a dance floor, and other things you need, while others won't. In addition, some venues will offer their own catering or a list of approved caterers, while others may allow you to use any catering company you want. After you've booked your venue, it's time to make some other decisions. The next few things need to be decided on very quickly as they all book up rather fast. Your caterer is vital to the celebration and they may book up as much as a year in advance. Make sure you choose a company that can work with your venue and the size wedding you plan to have. You can choose a traditional catering company or you can choose something unique, such as a food truck. Maybe the most important thing outside of the venue, the photographer needs to be booked well in advance. Some photographers book up more than a year in advance for weddings. Make sure you compare a few top wedding photographers online and choose one fitting your budget as quickly as possible. If your budget allows for a videographer, you want to hire one and get them booked quickly. There aren't as many choices with videographers as photographers and they book up very fast. Make sure you choose one and get them booked fast. The decision between a band and a DJ may depend on your budget and your taste. Regardless, once you've made this decision, get a band or a DJ booked as soon as possible. Even though you may have the perfect venue and they may provide some of the things you need, you may need to rent other things. If you booked an outdoor venue, you need to have a plan in case of rain or too much heat. Renting the right tents could provide the perfect option. Make sure you schedule all your rentals ahead of time, such as chairs, tables, arches, candelabras, flower stands and more. Once you've reached this point in the checklist, you've booked the most important elements of your wedding. Now it's time to have a little fun with some of the other things you need. Now it's time to start shopping for the perfect wedding dress. You need to do this several months in advance so that the dress can be altered and so that you have time to find the perfect dress. It can also be a good idea to leave a little money in the budget to ensure you can pay for a rush fee if you're cutting it close on time. You want to have a block of rooms secured at a discounted rate for your guests. This can easily be done ahead of time, but you want to make sure it's done many months in advance to ensure your guests have a choice of where to stay. You can also start thinking about getting those perfect engagement shots done. Head to the beach or your favorite spot in Jacksonville to have your photographer take your engagement pictures. This also allows you to see the photographer's work and if you're not thrilled, you may still have time to find a new photographer. Since you will be creating a wedding website, you want to register for wedding gifts first. This will allow you to share your registry online with those you plan to invite. A great way to keep your guests updated and to share your gift registry is with a wedding website. You want to put the URL on the save-the-dates, so this needs to be done first. About 9 months in advance, you want to send out save the date cards. You can even send them earlier if you have the time to do so. These precede the actual invitation and give those on the guest list the opportunity to start making plans. Once your dress is purchased and in the process of being altered, you want to handle your bridesmaids' dresses. These will also need to be fitted and you may be coordinating with bridesmaids not in town or with odd schedules. Make sure you do this far enough in advance to ensure they have plenty of time for fittings. While many of the other vendors book up rather fast, you can wait a little bit on your florist. However, you still want to book them many months in advance. Take the time to look online at their social media to see the work they have done in the past. This will help you get a good idea of what you want for your wedding, as well. Unless you're getting married in a church that provides the officiant and musicians, you will need to hire these important individuals. Make sure you do this at least six months in advance or you may struggle to find someone available to marry you. In addition, some officiants require pre-marital counseling, which is always a good idea, and you will need time to get this done. Depending on the type of transportation you will have for your wedding party and for the bride and groom, you may need to book this well in advance. Some limousine companies will book up fast for wedding season in Jacksonville and other unique transportation may also book up fast. Make sure any specialty transportation is booked many months in advance. Once you have the major wedding components booked, including setting the date and booking the venue, it's time to book the honeymoon. You want to do this plenty in advance, especially if you plan to travel somewhere popular. Consider booking a honeymoon with a gift registry allowing guests to buy your experiences on your honeymoon, as well. It should start with the groom's tux, but you can usually rent or buy the groom's tux and the groomsmen's tuxes all at the same time from the same place. In fact, some vendors will offer a discount or a free tux for the groom if you have a large enough wedding party. When you originally booked your caterer, you should have had a chance to plan a menu. Now, as the date gets closer, you want to do a final tasting to taste some of the items, if not all, that will be on the menu. This gives you the opportunity to make adjustments as you see necessary. In addition, make sure the caterer is prepared for any dietary restrictions, such as vegetarian, vegan, or gluten-free. You can ask any final questions at this tasting, as well. The cake needs to be chosen several months in advance and you want to take the time to taste a few cakes, if possible. The cake should express you and your fiancée as a couple and you may want to consider a groom's cake, too. The wedding bands are necessary and you want to get those ahead of time. Don't wait until the last minute for the wedding bands. Take the time to shop ahead of time and figure out what you prefer. About three to six months in advance, you want to send out the invitations. If you plan on having these done up with a calligrapher, make sure you hire someone with this skill. It's also important to include an RSVP card or a way for your guests to RSVP. Give them a deadline, too, or you may never get the final guest count. Make sure the theme of the invitations matches the theme of your wedding and provide any necessary information, such as times, will there be a full meal served or just appetizers? Will it be a cash bar or an open bar? You may need to book the rehearsal dinner venue well in advance, but you may only need a few months. This all depends on the venue and how busy they are. However, waiting until the last minute could mean you won't have as many options throughout Jacksonville. You have a few options with the makeup and hair trial. Some brides choose to do this along with their shower or bachelorette party. However, if you're doing your shower and bachelorette party last minute, you may want to do the trail further ahead of time. It's not mandatory to do favors or gift bags, but if you do, you should choose them in time to get them all ordered and in before the wedding. If you plan on having readings at your wedding, you want to choose them ahead of time. Even if you're not having a religious wedding, there are plenty of non-religious wedding readings to choose from. If you don't already know the officiant or they are not performing your pre-marital counseling, you want to meet with them ahead of time. Make sure to invite them to the rehearsal dinner and schedule the rehearsal, as well. If you're doing any DIY projects for your wedding, such as centerpieces, you want to craft these a few months early. The last thing you want to deal with is finishing a DIY project right before the wedding date. It's best to handle the marriage license ahead of time, just in case. You don't want to wait until the last minute. Make sure you get your marriage license from your county's Clerk of Courts in advance. There is a three-day waiting period and they do offer the ability to waive this three-day waiting period if you attend one of the premarital courses. Contact your county's Clerk of Courts for more information. Your musicians, DJ, and/or band need your music ahead of time. You want to choose the music for both the ceremony and the reception. Create a playlist for the reception and decide if there are certain types of songs you simply don't want your DJ or band to play. Relay this information to the necessary parties in advance. Buying a gift for those in your wedding party is something you should certainly do. Make sure you do this ahead of time and have the gifts ready for the day of the ceremony or for the time you plan to give them out. About a month before the wedding, it's best to pay the vendors in full. This is the best way to ensure you don't have to deal with vendors trying to chase you down while you're trying to enjoy your honeymoon. Guests need to know where to sit and you want to create a seating chart to ensure everybody has a place at the reception. Usually, for the ceremony, you have a bride's side and a groom's side. Each guest will need a place card to be found in front of the seat they are supposed to occupy. Make sure these are made in advance and ready to be put out for the reception. You want to tip certain people helping with your wedding, such as the officiant, catering wait staff, bartenders, musicians, hair stylists, and others. Have these tips and any other money needing to be paid on the day of in envelopes ready to go for the day. You can even put it inside a "Thank You" card you have personally written. About a week before the wedding or a couple of weeks, you want to put on your dress and move around in it. Try to break it in, along with your shoes to avoid any blisters or issues on the wedding day. If you and your soon-to-be spouse are writing vows, now is the time to get them written and ready to go. The week before the wedding has plenty of things you will need to do. Here's a list of what needs done the week of the wedding. Grooming - Men and women, eyebrows, manicure/pedicure, hair coloring, etc. Lay out all the items for your photographer, such as invitations, programs, rings, etc. Now, the day has arrived and it's time to enjoy everything you've worked so hard for.